Back in 1989, when Bev and I bought our 1 acre with an old house, we knew we would be doing some frugal gardening. The widow lady that we bought the place from had been a gardener, so there was already a good start: lots of trees, shrubs, roses and of course a vegetable plot. Over the years, things have changed. I've taken out some trees, we lost some roses to a bad freeze, but planted more in another spot, the original garden spot now has a shop on it and we have a lot of raised beds scattered all over the place. At one point, we had a large set of beds for herbs, which now contains two varieties of thornless blackberries; Apache and Triple-crown. This is what the Apache bed looks like in the winter. The plastic ties are just strips cut from your everyday grocery sack. This is a shot of the same Apache Blackberries in early spring, 2009. This year (2009) will be the first year for full production, so our fingers are crossed for a good harvest. This is a 3 tiered strawberry bed that I added in 2007. It's made from 6 old tires. In terms of being a frugal gardener, this is a good example. To buy a similar bed made from light-weight aluminum would cost $45-$50 with the shipping. I built this bed, with a central sprinkler set up, for less than $10. One of the nice things about it is that if I happen to put my knee on the edge of the lower ring while pulling weeds or picking strawberries from the top ring, it just springs back in shape. We used to have a pair of the aluminum beds, and if you even thought about touching the edge, they would bend over, leaving a permanent crease after you tried to straighten it back up. 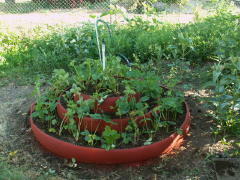 In 2008 I added 2 more of these tire beds for more strawberries. Needless to say, they could also be used for herbs or vegetables or flowers. It is also possible to create a frugal indoor herb garden if you don't have room for a tire bed. I have also built several raised beds with cement sides and they are set up to convert into greenhouse beds for my early spring and late fall plantings. There are several frugal gardening tips that you can access here. Although we aren't certified as organic farmers, we do grow all of our plants on organic principles. We use compost for fertilizer and mulch for weed control and companion plant for insect control. I have used old tires in several places to put in borders as well as making raised beds.